Days in 2019 are flying by so fast that we are already in the fourth month of the year. Yes, it’s April 2019, and it’s time to look at the festivals, international days, bank holidays, and events calendar. Speaking festivals and important days, this month is so very full of it. There are several religious festivals from different faiths and cultures such as Chaitra Navratri, Gudi Padwa, Ugadi, Rama Navami, Hanuman Jayanti among many in Hinduism; Vaisakhi or Baisakhi in Sikhism; Good Friday and Easter Sunday in Christianity; Mahavir Jayanti, one of the most important religious festivals for Jains. Not only religious observances, but April is also full of international days such as April Fools’ Day, World Health Day, Earth Day, International Dance Day, and so many more. Let us look at the April 2019 calendar in detail, the important days and events to commemorate, along with religious festivals, birth and death anniversaries. Calendar 2019 For Free Download in PDF: Know List of Hindu Festivals, Holidays, Fasts According to Drik Panchang, Kalnirnay, Lala Ramswaroop Calendars Online. The first day of April is celebrated as April Fools’ Day, a day dedicated to practical jokes and hoaxes. 1st of April in India is also declared as Bank’s Holiday. Month’s first Hindu fast (vrat), Papamochani Ekadashi to please Lord Vishnu also falls on the day. It is believed devotees who observe this fast get riddance of all their ‘mistakes’ and ‘sins’. April 6 is the most important day of the first week. It will mark the beginning of Chaitra Navratri or Vasanta Navratri, one of the four Navratri (nine nights) dedicated to Goddess Durga. Meanwhile, Gudi Padwa in Maharashtra and Ugadi (Chaitra Sukladi) in Andhra Pradesh, two spring-time festivals are celebrated as the New Year’s Day. The opening week of April will conclude with Cheti Chand or Jhulelal Jayanti, a festival which marks the beginning of the Hindu New Year for the Sindhi Hindus. Speaking of important days, the week will see days such as World Autism Awareness Day, National Maritime Day, World Health Day and many more. Yamuna Chhath on April 11 and Rama Navami on April 14 are two of the biggest festivals in the second week. Yamuna Chhath also known as ‘Yamuna Jayanti’ is dedicated to Goddess Yamuna and is celebrated with great fun and enthusiasm in Mathura and Vrindavan. As for Rama Navami, it is one of the major Hindu festivals commemorating the birthday of Lord Rama, the seventh avatar of Lord Vishnu. April 14 will also be celebrated as Ambedkar Jayanti, an annual festival observed to commemorate the memory of Dr Babasaheb Ambedkar. On the very same day, Vaisakhi, a religious Sikhs festival will also be observed. Vaisakhi, also known as Baisakhi marks the Punjabi New Year. In the next week, Pôhela Boishakh, also known as Bengali New Year on April 15, Mahavir Jayanti on April 17, Hanuman Jayanti and Good Friday on April 19, Easter on April 21 will draw major attractions. In the last week of April, there are not many religious observances but a great many important international events. There are days dedicated to languages such as Chinese Language Day, English Language Day and Spanish Language Day. April also has a number of days dedicated to health and wellness such as World Autism Awareness Day, World Health Day, World Malaria Day, World Haemophilia Day, World Meningitis Day and more. 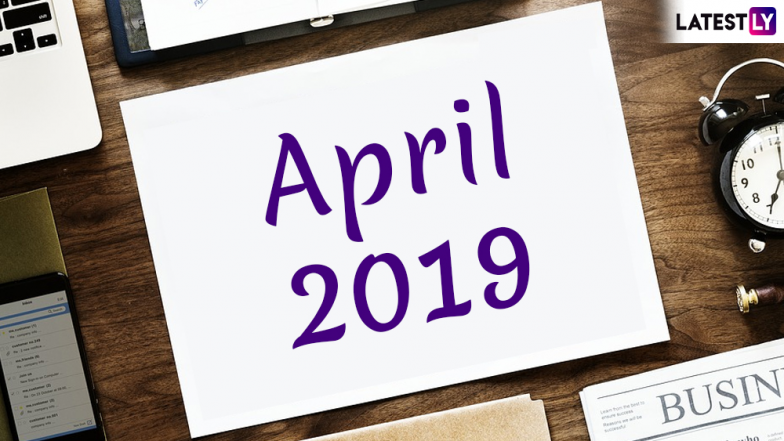 So that was it for April, keep glued to this section as we will return with the monthly calendar of May 2019.